Linda Mitchell, who was born in Atlanta in 1960, grew up in a family that nurtured her strong, early interest in both animals and making art. In a home decorated with hand-made quilts, her mother bred cocker spaniels, and Mitchell was encouraged by a great-aunt who taught music, art, and drama. As a child, she started painting, making animal figurines, and sewing, all of which informed her work as a mature artist. After studying at Georgia State University and Berry College, Mitchell attended the University of Georgia, receiving a BFA in 1982. While there she developed a special interest in lithography, and she credits printmaking for spurring her feeling for layering images and textures. Mitchell went on to receive an MFA in painting from the University of Georgia in 1990, and an MFA in sculpture from Georgia State University in 1994. Mitchell’s early work focused on animals in multi-panel paintings, featuring cut-out figures, and other dimensional elements. The paintings focused on fluidly painted four-legged creatures in dramatic situations, emphasizing their human qualities. Mitchell turned to sculptural work using exposed wire armatures to create animals forms. She created disturbing scenarios of stalking and predation with multiple figures, some of which were fleshed out with fabric and black sand. A collage class that Mitchell took near the end of graduate school became a real impetus in her developing a personal visual language. Collage allowed her to combine her impulse for image-making with her sculptural facility. In the dream-like juxtaposing of the real and the imagined she feels a kinship with four modern masters: Chagall, Miró, Tanguy, and Rousseau. In 2000 Mitchell began creating large acrylic paintings that combined actual objects with painted illusion. This work culminated in an 8'x18' installation of over-lapping paintings, Embrace the Messy, exhibited in 2004. The show’s title embodies the artist’s intuitive approach that allows poetic meaning to emerge from the highly textural layering of painted and digital images with a variety of materials. Mitchell’s sculptural inclination was spurred after the birth of her son in 1995 and she began making animal figures using Play-Doh. In 2006 she started sewing fabric animals as well. 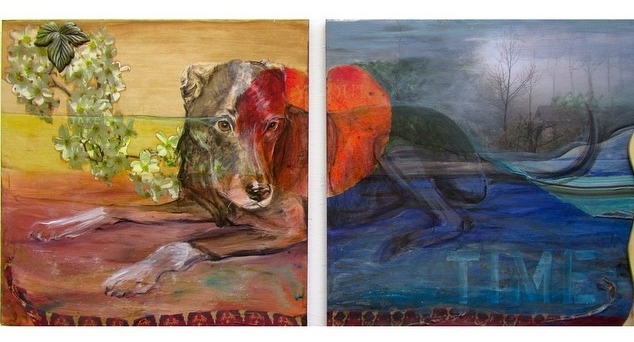 The animal figures have been used as models for paintings and as photographic images collaged to the surface of pieces. The animals often express human emotions as they are combined with images of ephemeral beauty from nature. Other major installations are the 2006 Serio in Verse, which alternated paintings with sculptural fabric animals, and the 2007 Too Much Will Never Be Enough. The latter is ruled by a fabric sculpture of Louis XIV as a horned animal avatar, flanked by fantastic paintings inspired by Mitchell’s European travels. 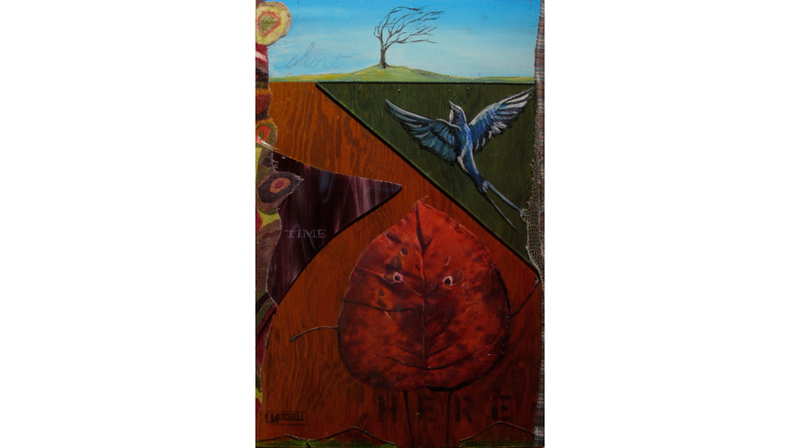 Linda Mitchell has exhibited her paintings extensively with her solo exhibitions including those at Peninsula Fine Arts Center, , Atlanta, GA, Radford University Museum, Visual Arts Center of Northwest Florida, Panama City, FL, Spiva Center for the Arts, Joplin, MO, The Goddard Center, Ardmore, OK, Tinney + Cannon Contemporary, Nashville, Mason Murer Fine Art and One Twelve non-profit Gallery, Atlanta, GA, Georgia State University, and the Metropolitan Arts Council, Birmingham, AL.